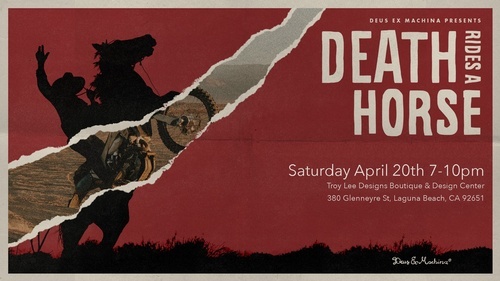 Join us at Troy Lee Designs Saturday, April 20th from 6-10pm to watch the Deus Movie "Death Rides A Horse". There will be food and drinks! Don't miss the fun! Since the 1940’s, people have been taking the trip to Baja to ride motorcycles. Thoughtout the 1960’s, other were making the same pilgrimage for the waves. In the Summer of 2018, six friends, four custom bikes with surf racks, and a ’63 Chevy panel wagon made the trip to do both. Deus Ex Machina presents ‘DEATH RIDES A HORSE’ the latest feature film directed by Dustin Humphrey, the man behind South to Sian. Featuring Forrest Minchinton, Harrison Roach, Zye Norris, Matt Cuddihy, Lewie Dunn, Micah Davis and others.